The following is a memo outlining a recovery plan for monarch butterflies. On 1 March I received an email from a person well connected with monarchs asking me to prepare a document, a prospectus or memo, for business leaders by the end of the day. I was told that these persons needed background information about the monarch population along with a rough idea of what would be required to address the loss of milkweed/monarch habitat. The memo was prepared in haste and is not inclusive of all the components needed to successfully stabilize and then increase the milkweed habitats that support the monarch population. Nevertheless, this document outlines some of the basic issues. Hopefully these ideas will be useful in shaping the conversations needed to create a vision and plan as to how best to restore the monarch population. The original memo has been rewritten to improve clarity. An explanation of the estimated annual loss of habitat has been added as well. The following text is a brief summary of the status of the monarch butterfly population. The reasons for the rapid decline in monarch numbers are discussed along with a proposed recovery plan. Recovery will be possible if 1) plans can be implemented to offset the annual losses of milkweed due to development and the expansion of croplands and 2) significant efforts are made to maintain the milkweed corridor that sustains the vast majority of monarchs that reach the overwintering sites in Mexico. The number of hectares of forest occupied by overwintering monarch populations in the Monarch Butterfly Biosphere Reserve (and neighboring sites) in Mexico is shown in Figure 1 below. 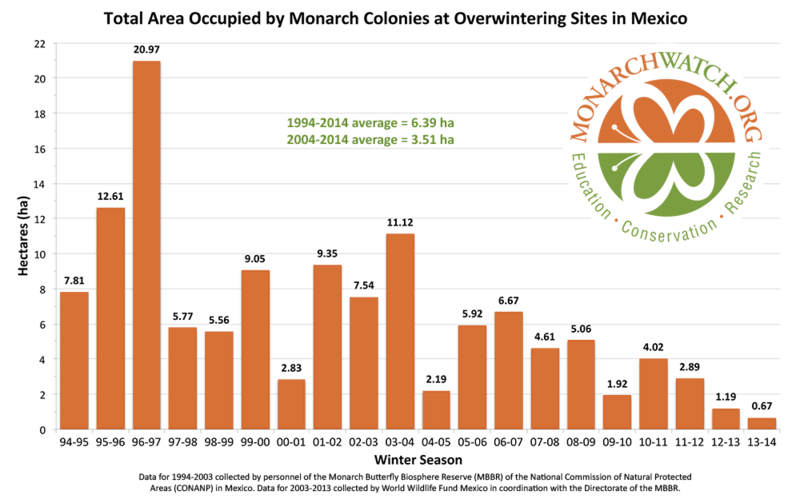 The forest area occupied by monarchs for 2013-2014 is the lowest recorded to date and continues the progression toward smaller winter numbers seen over the last decade. The decline has been attributed to three main factors: 1) the widespread adoption of herbicide tolerant corn and soybean varieties by North American farmers which has had the effect of eliminating milkweeds (the host plants for monarchs) within the crop fields; 2) the ethanol mandate passed by Congress in 2007 that increased the price of corn and soybeans which in turn led to the conversion of grasslands to crops thus elimination of the milkweeds that occurred in these areas; and 3) three consecutive years during which the reproductive success of the summer breeding population was limited by unfavorable weather conditions. The loss of habitat, i.e. milkweed and nectar plants that sustain the monarch population, is massive yet can be mitigated. In the paragraphs below I will briefly outline a vision and goals for monarch recovery and will describe the infrastructure, resources and partnerships needed to implement this recovery plan. Figure 1. Total area occupied by monarch colonies at overwintering sites in Mexico. Although monarchs can be found throughout the United States and southern Canada in the summer months, the main part of the population utilizes two critical areas with milkweeds: 1) the spring breeding area shown in Figure 2 below which encompasses most of Texas, Oklahoma, and part of Arkansas and Kansas; and 2) the upper Midwest (the eastern Dakotas, Minnesota, Wisconsin, Iowa, Illinois, Michigan and parts of Indiana). Monarchs arriving in the southern area from Mexico (in March) lay eggs on milkweeds, and the adults that develop as a result of this reproduction move northward into the summer breeding range in May and early June. This northward moving first generation spreads out over the north from the Dakotas to the Maritime Provinces in Canada. However, it is the production of the monarchs in the center of the “corn belt” that is critical. Our tagging data over the last 20 years and an earlier study using isotopes (Hobson and Wassenaar 1998, Wassenaar, et al. 1999) have shown that most of the monarchs reaching the overwintering locations in Mexico originate from this region. Figure 2. Spring and summer breeding areas in the milkweed/monarch corridor in relation to corn acreage planted in 2011. These two important areas of reproduction constitute what I call the milkweed/monarch corridor. Unfortunately, it is within this corridor that a large portion of the milkweed-containing habitat has been eliminated (Figure 3). Loss of habitat in this region is likely to continue which will lead to a further decline in monarch numbers. Figure 3. Areas of grasslands, shrub lands and wetlands converted to croplands 2008-2011. 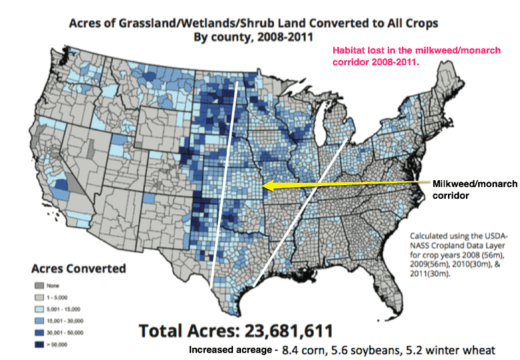 Increases in acreage by crop type are shown at the bottom of the figure. From Faber, et al. 2012. The monarch population will continue to decline unless 1) the annual loss of habitat (.5 to 1.5 million acres**), due to conversion of landscapes to crops and development, is addressed and 2) large-scale restoration of milkweeds is initiated to offset the losses of habitat that have occurred over the last 15 years. The monarch migration can be saved if there is commitment to the two propositions outlined in the premise to 1) offset annual losses of habitat by planting milkweeds and nectar plants in areas from which they have been extirpated and 2) develop the capacity to plant milkweeds over large landscapes. Both projects require the development of greater capacity to restore milkweeds than exists at present. Implementation of this recovery plan will depend upon the development of many different components. The program will require: 1) marketing and outreach so as to engage citizens, agencies, corporations, institutions and farmers; 2) a means of identifying landscapes on which milkweeds can be restored such as Conservation Reserve Program (CRP) lands, private lands, roadsides, federal lands, state and local parks, marginal landscapes, corporate landscapes and buffer strips; 3) a program to develop partners who can contribute to the success of the program such as nurseries, seed growers and native plant societies; 4) participants who can help with the seed collecting and plantings such as children in 4H programs, Future Farmers of America (FFA), Scouts, schools and other environmental organizations; and 5) communications with Federal, State and Local authorities to facilitate these efforts. In my view, the capacity to offset annual losses of milkweed/monarch habitat doesn’t exist at this time. The production of milkweed seeds and plugs (small plants) needs to increase rapidly. In addition, outreach needs to be developed and partnerships formed to get the seeds and plugs planted. By moving rapidly to implement this plan, the means to offset annual habitat losses can be developed in three years, and by the fourth year it should be possible to address the habitat losses that have accumulated over the last 15 years. Offsetting the annual habitat loss will require the establishment of at least 5-15 million milkweeds via the planting of seeds and plugs. Given the need to develop the infrastructure – seed production, etc., mentioned above, my estimate is that the yearly budget for this program should be $xxxxx million***. If more funds are available, the project could be expedited. *This memo details what might be done to restore the monarch population that breeds east of the Rocky Mountains. 1) Conversion of grassland and retired CRP lands to croplands will continue at rates of 350-450 thousand acres per year. 2) Loss of habitat due to development will continue. The annual conversion of landscapes in the United States to building sites and the expansion of cities is in excess of 2 million acres per year. Much of this development, perhaps 500,000 acres, occurs in the monarch summer breeding range. Other losses, perhaps 100,000 acres per year, are occurring in monarchs’ spring breeding range. 3) Losses outside the corridor will continue and these losses will also have a negative impact on monarch numbers. 4) There are additional losses of milkweed/monarch habitats that are not easily accounted for such as land management decisions that eliminate milkweeds and other forbs from pasturelands, roadsides and other land parcels. 5) Lastly, this interpretation assumes that the price of corn will remain in the $4-$5/bu range. Higher prices are likely to result in the conversion of more milkweed containing habitats to croplands. It should be clear that, although the figures for the annual loss of milkweed/monarch habitat are not firm, it is likely that these losses will be close to a million acres per year for the foreseeable future. ***I have not prepared budget for this project. As you can see from the above, capacity building and implementation are both complicated and will require a major effort from many participants. Suffice to say, the annual cost of this program will be many millions. The project needs to be refined more precisely before dollar figures can be assigned to the different cost centers. http://www.fsa.usda.gov/FSA/webapp?area=newsroom&subject=landing&topic=foi-er-fri-dtc (accessed 28 January 2014). Faber, Scott, Soren Rundquist and Tim Male. 2012. Plowed Under: How Crop Subsidies Contribute to Massive Habitat Losses. Environmental Working Group http://static.ewg.org/pdf/plowed_under.pdf (accessed 28 January 2014). Hobson, Keith A., Leonard I. Wassenaar and Orley R. Taylor. 1999. Stable isotopes (dD and d13C) are geographic indicators of natal origins of monarch butterflies in eastern North America. Oecologia (1999) 120:397±404. Wassenaar LI, Hobson KA. 1998. Natal origins of migratory monarch butterflies at wintering colonies in Mexico: new isotopic evidence. Proc Natl Acad Sci 95:15436±15439. For further information about monarchs, milkweeds and Monarch Watch, please visit MonarchWatch.org. Obviously, mitigating the decline in the monarch population will require a great deal of discussion. In the above I’ve only addressed what it might take to mitigate the annual losses of milkweed monarch habitat. The larger issue is how to restore sufficient habitat so that the overwintering monarch population will be large enough, and will survive in sufficient numbers to repopulate the milkweed/monarch corridor each year. There is a history of catastrophic mortality at the overwintering sites (70-80% losses due to winter storm in 2002 and 2004). The large overwintering populations of 2001-2002 (9.35ha) and 2003-2004 (11.12ha) survived in sufficient numbers to recover from these losses in two years. Overwintering populations of a hectare or less will not fare as well should they experience such mortality. The recovery would take much longer. How can the latter scenario be avoided? My interpretation is that – at a minimum – our larger target should be to provide sufficient milkweed/monarch habitat to sustain populations of 4 hectares or more from year to year. Even with high winter losses such populations should be robust enough to repopulate the United States in the spring. There are more questions of course. What are the near and long term goals? How much will the project cost and where will the funds come from? Will public funds be available? Will corporations, foundations, environmental organizations and private individuals support this effort? How will the funds be administrated? Who are going to be the partners in this enterprise and who will take the lead in coordinating the implementation of this program? There are lots of questions; monarchs need the answers. Thank you for your interest and continued support!